I will continue to add items here over the next few weeks. It will consist of text and photographs of surface preparation, the painting process, tips, short cuts, and how to get some cool effects with acrylic paints. Field Photograph taken in late summer 2007 on Great Pond, Kingston, New Hampshire. Click on the photographs to see a larger version. 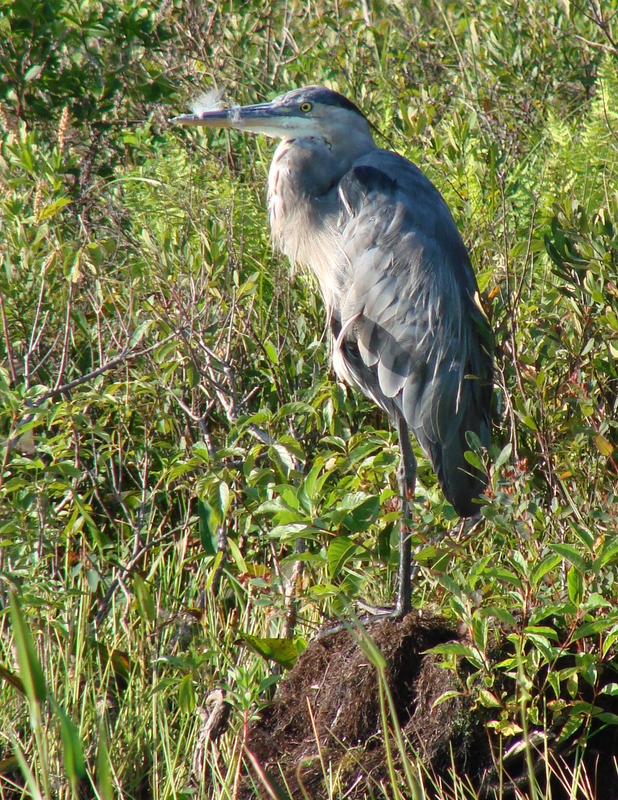 On an early morning kayak fishing trip with my son, we came upon a Great Blue Heron napping on a hummock of grass. He was standing on one leg, facing the rising morning sun. The warmth of the sun was burning off the fog and warming the heron. We quietly approached; and if we moved too fast, he would open his eyes and start to unfold the leg he had tucked against his body to conserve heat. I knew from past experience that he would surely take flight once both feet were planted on the hummock. We would then stop all movement, and as soon as he tucked his leg up again, we would take a couple of slow, smooth oar strokes, getting closer each time. We passed about 30 feet from him, and I got a dozen good shots as we quietly glided past. It was one of those great outdoor moments where everything came together for a good shot. I drew a grid on a digital 8 x 11 photograph of the heron, scribing lines with a ruler and the back edge of an X-Acto knife. Using the back side of the blade and pressing lightly on the knife removes the ink without cutting the paper and leaves a clean, thin white line. 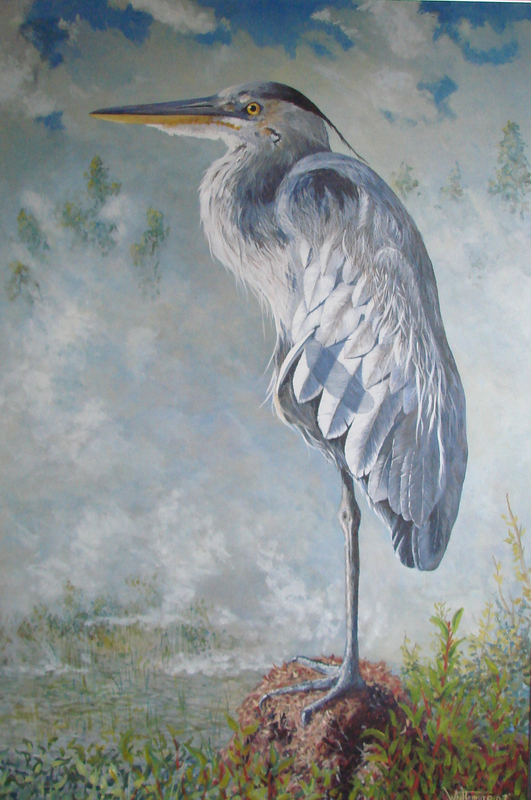 The background in the photo was too busy and would detract from the focal point of the heron. I chose to show the early morning fog we paddled through as it was burning off and rising and to show a suggestion of a forested shore line emerging from the fog. Sky and water: cerulean blue, cobalt blue, burnt umber and white. Background trees: yellow ocher and ultramarine blue. 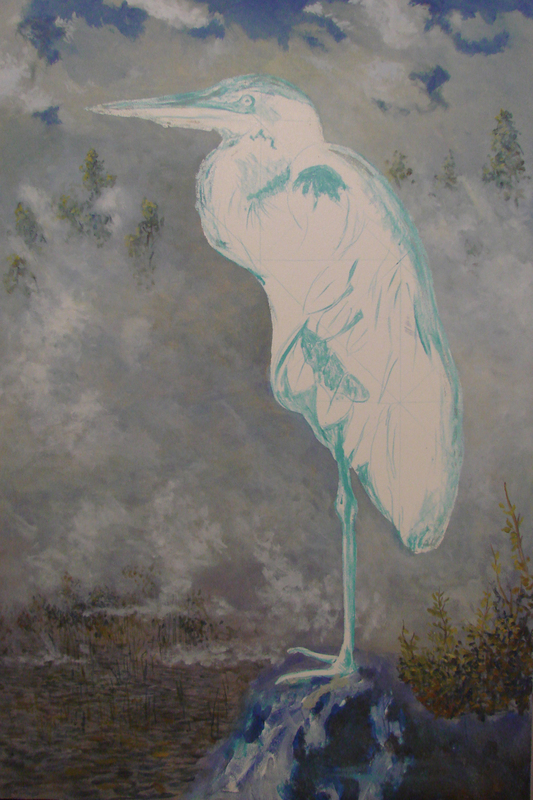 Heron: ultramarine blue, burnt umber and white for the feathers and leg. A touch of yellow for the eye and bill. Hummock: burnt umber, ultramarine blue, burnt and raw sienna. Foreground bushes: yellow ocher, ultramarine blue and a touch of acra red and cadmium red. For this part, I paint the panel flat on my work table. I began with a 24 X 36 inch untempered Masonite board and applied three coats of Gesso using a (Sureline brand) short-nap roller. I let it dry thoroughly and sand lightly between coats. See the tab on Surface Preparation of Masonite Panels. I transferred the grid on the photo, drawing the lines with thinned cerulean blue, then sketched the heron with the same thin blue. I blocked in the light and dark areas of the hummock with cerulean blue and burnt umber, followed with a thin wash of cadmium orange over the sky and water. I paint the orange on very thinly and all at once, and get the whole surface fairly wet with a spray bottle of water with a few drops of dishwashing detergent in it. I worked quickly and freely with a large, soft brush and rag to get the color down. I immediately sprinkle the whole area with clean water with a few drops of dishwashing detergent in it. Dipping your finger tips in the water/soap mixture and flicking the water on randomly works great. Wait only a few moments, then blot up the excess water with a crumpled wad of paper towels or large, soft rag (terrycloth works well). The goal is to have a lot of broken color with some of the white gesso showing through the orange wash. As you can see, the grid and cross lines can still be seen in the photo. Sunrise Sentinel, Step 2: Background and Sky. Still keeping the panel flat, the goal is to build up layers of thin paint through a series of scumbles, one over another, to get just enough layers and colors to suggest a good, misty or foggy morning. I use multiple layers of scumbles, applied thinly, to allow all of the colors to combine visually through the viewer’s eye to represent the effect I’m trying to produce. Remember, we are creating an illusion of a foggy morning with the sun burning off the morning mist. 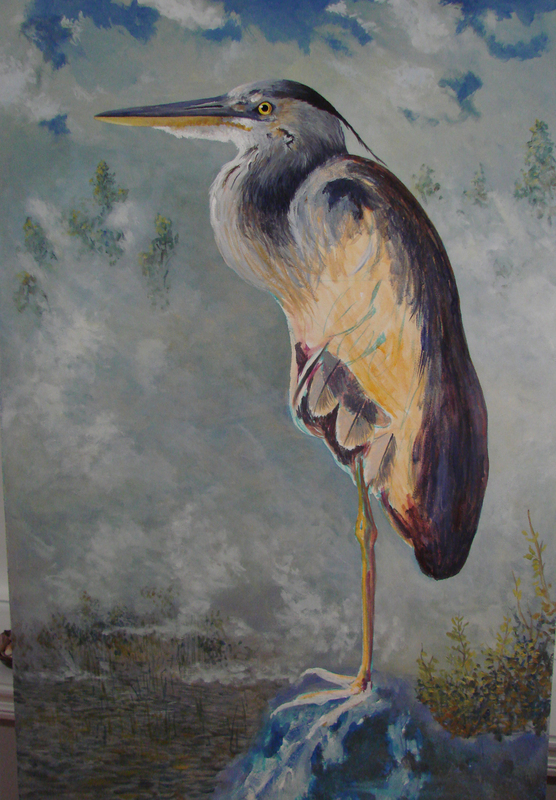 It is all painted rather loosely as I want the sky to be secondary to the focal point, the heron, which is painted (on the easel) with much more care and detail. Keep a small spray bottle to mist the surface with water and soap mix handy. This bottle will help to keep the surface slightly damp (I found this bottle at WalMart, in the travel cosmetic container section, for 97 cents). This is where the little peaks and valleys from the rolled gesso primer hold minute pockets of concentrated color. When all is dry, I moved the panel to the easel and began the sky using Cerulean blue, white and burnt umber to build up the sky with a series of scumbles. To keep the fast-drying acrylic from drying out too soon, I continually lightly mist the surface with water with a few drops of liquid dish washing soap in it. I used a Loew-Cornell, Comfort # 8 round brush (or any brush you favor). About the word “scumble”, this is the action I use of quickly scrubbing thinned acrylic paint, in a random motion, partly covering the previous layer of paint. You want some of the previous layer to show through each time you lay down a scumble. The brush action goes every which way in doing this without completely covering the previous layer(s) of paint. It’s done quickly and produces a good effect on Masonite panels or canvas. The viewer’s eye will naturally mix the colors in their brain. Sunrise Sentinel Step 3, background and sky. I continued to build up thin scumbles adding more mist and clouds by increasing the white, burnt umber and cerulean blue. I began adding the distant trees with yellow ocher and curlean blue. I added a touch of yellow ocher to warm up the clouds at this point. The trick here is to work the whole panel, moving all over to balance the lighter sky with the darker water area. It’s easier to accomplish than it sounds. Sunrise Sentinel, Step 4: Background and Sky. Next, I worked in some cerulean blue and a touch of cobalt blue for the sky and began to loosely paint the water, reeds and some foreground brush. Once again, all this is suggested rather than detailed; you don’t want to overwork this area. 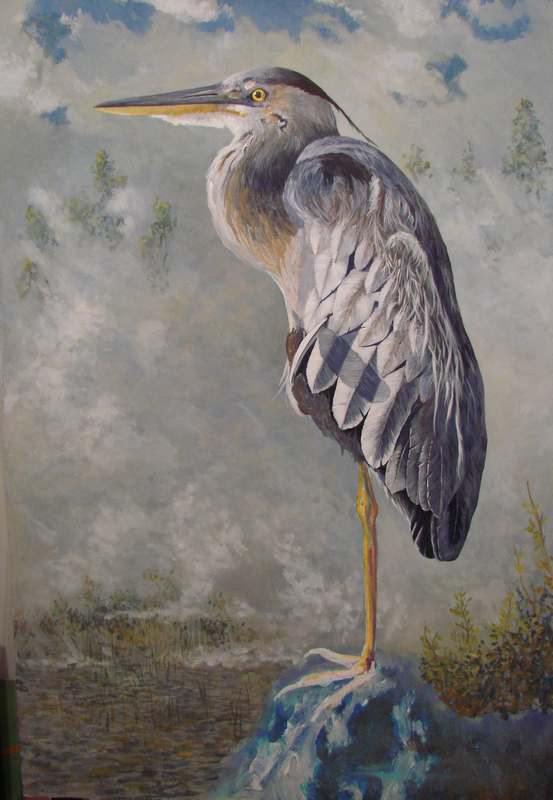 I use the cadmium orange and violet to under paint the light and dark areas of the heron. Note that the wing had a feather sticking out at a right angle on the wing. This cast a shadow across the wing and added a bit of interest. Sunrise Sentinel, Step 6: Painting the Head and Neck. 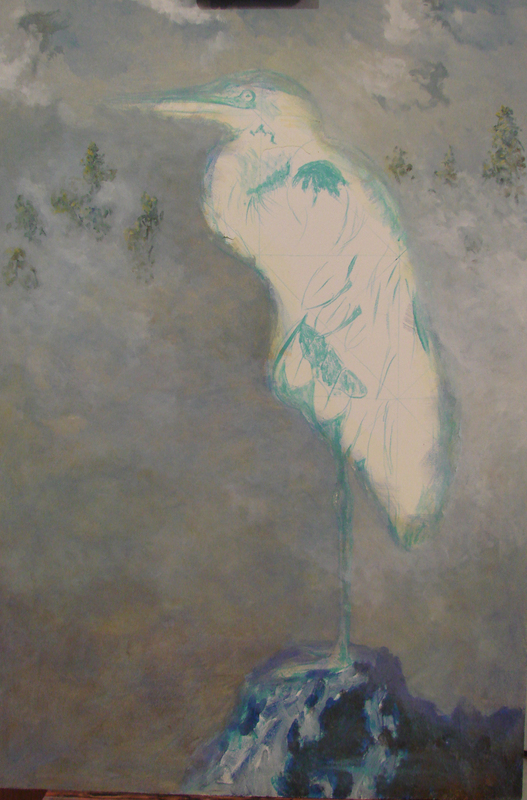 I worked from the head and neck first, using the same brush used to lay in the sky and water. I began laying down overlapping and criss-crossing strokes of paint in shades of grey mixed with burnt umber, ultramarine blue and white. I worked in the beak with yellow ocher and white and the crest with the darkest grey from these combinations of colors. As I worked, I adjusted the areas of light and dark with repeating finer and finer strokes of grey. The final brush strokes were with a Grumbacher, Golden Edge # 4 round. During the whole process of building the overlapping strokes of the feathers, the advantage of a durable, tough and unyielding surface of Masonite came into play. I use a single-edge razor blade held in a small plastic holder to frequently scrape away some of the paint between applications. These holders can be purchased in any paint department of a hardware store for about a buck. Just work carefully and don’t put too much pressure on the plastic scraper on either edge, lest it gouges the surface too deeply. This works better than sandpaper and its easier (and safer) to control the pressure of the razor blade if it’s in the plastic holder. Hold the blade at a slight angle and scrape along the flow of the brushstrokes. This works best in areas with a lot of detail and results in a very smooth finish to continue building the layers of color and adding visual texture without a heavy build-up of paint. The background uses the dimples, peaks and valleys caused by the paint roller to hold minute pools of color from the earlier scumbles. The scraping of the entire bird results in a very smooth finish and creates a great visual and textural contrast. 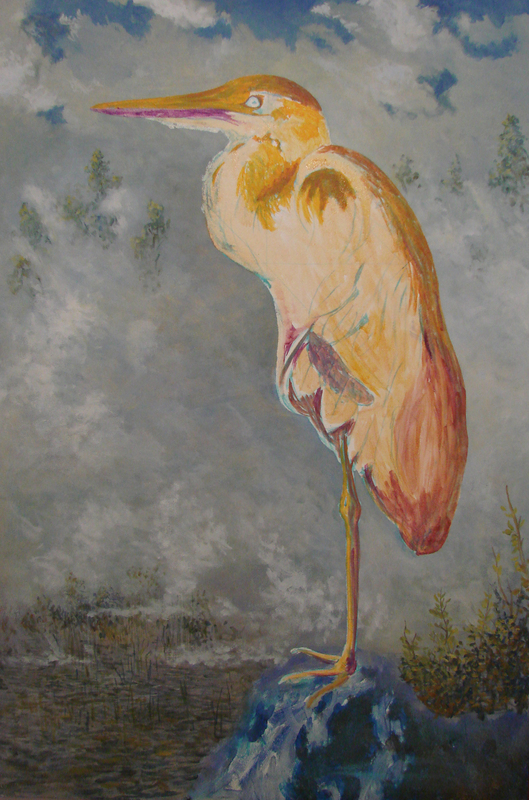 The loose and free rendering of the background against the tight and precise painting of the feathers works very well. This same process was used in the painting A Bouquet Found, where the stone wall, grass and moss growth on the wall was well-textured against the glass smooth surfaces of the rusty metal fittings, glass and porcelain door knobs. Sunrise Sentinel, Step 7: The Final Stretch. 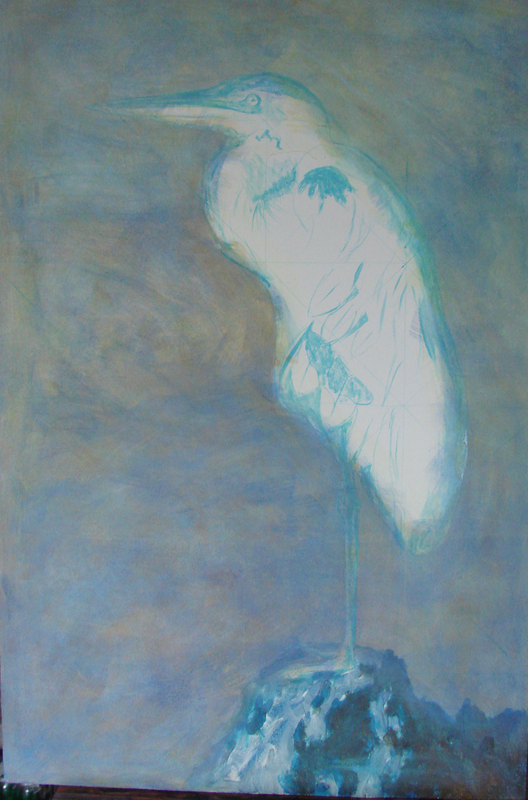 I began by laying out the group of larger wing and tail feathers with cerulean blue. I worked on one feather at a time using ultramarine blue, burnt umber and white. This is where the single-edge razor blade (on the Masonite) is used often. I used the field photo enlarged to 8 X 11 and a head-mounted Opti-VISOR magnifier with a #7 lens plate to get the details right. This is one of my essential “Other Tools” that magnifies 2 ¾ times, mounts on an adjustable head band, and leaves your hands free to work. Google Opti-VISOR and several sources will come up. Price varies on the sites. I found the #7 lens plate works great. It is one of the best investments I’ve made and I use this constantly on painting fine work and it is essential for my model ship work (See the Ship Models tab). 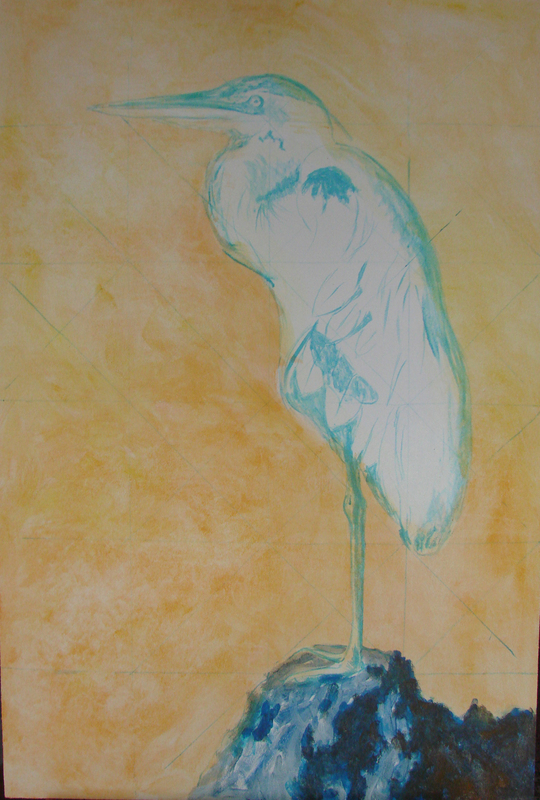 Painting the body and wing feathers is the same process as step 6, painting the head and neck. This time, I began at the tail and worked my way up. Working on one (large) tail and wing primary feather at a time, I put down a series of washes, alternating with some scraping with the razor blade to keep the paint build-up to a minimum. The light source was the rising sun lighting the heron from the left at a low angle. I kept the color and detail balanced by going back and adjusting some of the feather’s shading, and the detail of the main quill and feather edges. The fine feathers on the back, and partly covering the primary wing feathers, were painted in a series of thin, overlapping strokes using the Grumbacher Golden Edge round (#4623) brush. I always keep a hair dryer at the work bench or easel to dry a passage quickly because at this point, the acrylic paint doesn’t dry fast enough. This is tedious work, and took quite a few painting sessions to complete. The end effort was well worth it. The breast feathers were next, using the #8 round brush and the same colors. The legs and feet of a heron are huge! They distribute their weight over a large area, and they can walk across dense water lilies and muck with ease. Their neck is very long and held in a gentle “S” while stalking. The move very slowly and deliberately while hunting. When they see their prey, they fold up their neck in a tighter “S” and strike with lightning speed. They miss occasionally, and will try again once the prey returns to the spot. I watched one stalk and grab a good-sized bass. I never thought he could swallow it. However, with a couple of quick adjustments of the fish, he got the bass pointing head-first into his beak; and with a quick motion, swallowed it in one big gulp. Most impressive! I finished the leg (one was folded up into the chest feathers) and foot. The hummock and foreground brush were done quickly and loosely, without much detail. I usually let a painting sit for a few days after I think it’s finished. I look at it frequently, and hold it to a mirror or turn it upside down. I do this with a critical eye, and this different perspective will sometimes show up a fault in composition or tone, or some other adjustment that is needed. All through the work, I constantly made small adjustments of tone, color and composition over the whole painting and fix any mistakes as soon as I see them. If I don’t, the mistake will haunt me through the entire painting and I will end up with a less than a personally satisfying painting. Putting in your best effort and using your own critical eye is the best judge of your own work. Last, I applied three coats of slightly thinned, clear matte acrylic medium to finish it all off. 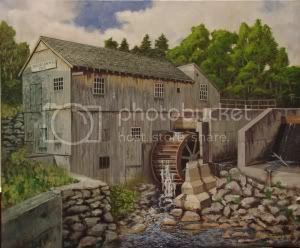 This painting won Best in Show at the Greater Salem Artists Association in the 2008 art show. It is now in a private collection. I hope you enjoyed this on-line demonstration. Comments are always welcome; and keep checking the site for more of the same. This is a terrific blog, im glad I stumbled upon this. Ill be back again in the future to check out other posts that you have on your blog. This is a amazing post, but I was wondering how do I suscribe to the RSS feed?